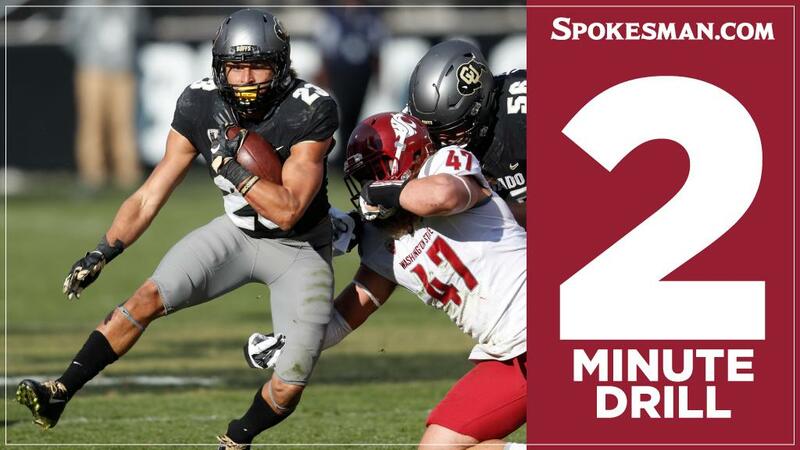 UPDATED: Fri., Oct. 20, 2017, 5:21 p.m.
Colorado running back Phillip Lindsay has more all-purpose yards than any other player in school history (5,174), but the Cougars can’t assume they’ve neutralized the Buffaloes’ offense by neutralizing the senior tailback. Leading CU receiver Bryce Bobo is also a nightmare for opposing defenses and will likely finish his career inside the school’s top-10 in receptions. Bobo leads the Buffaloes in total receptions (40), receiving yards (432) and touchdown catches (5). Lindsay’s good for 25 carries per game on average, but did rush 41 times in a game against Arizona a few weeks back, so the Cougars will have to bludgeon him over and over again to keep the senior from truly breaking out. And they’ll have to handle CU first-year starting quarterback Steven Montez, an adept passer and runner who isn’t the physical load that Sefo Liufau was but is every bit as slippery. Wind gusts and rain showers should be rolling through the Palouse Saturday night, so WSU’s stable of running backs could see more work than they have all season. The Buffaloes were strong against the run in nonconference play, conceding just 315 yards in three games, but in the Pac-12 they’ve allowed more than 260 per game. In the last two contests, CU allowed nearly 700 rushing yards to Arizona (413) and Oregon State (280). The Cougars played a total of 94 football games with Bill Moos as the school’s athletic director. In those 94 games, they compiled a record of 41-53. The last time WSU played a game without Moos as AD was the 2009 Apple Cup. The Cougars will hope Saturday’s game goes better than that one did. WSU lost 30-0 to its cross-state rival at Husky Stadium. Published: Oct. 20, 2017, 2:33 p.m. Updated: Oct. 20, 2017, 5:21 p.m.